Aesthetically appealing and ergonomically designed to easily fit in a consumer’s hand, the new package for Quick Dissolve Sugar (finer than traditional granulated sugar and rapidly blends in to sweeten hot or cold beverages) and Pourable Brown Sugar (does not clump or harden) will be launching in mid-November in retail stores across the US. They were previously packaging in cardboard cartons. Initially the design objective of the project was to leverage core brand equity and improve the consumer’s usage experience through a package redesign. During the research phase, designers discovered that there was an opportunity for a package specifically designed for tabletop usage that would eliminate the need to refill a sugar bowl from a larger package. Once it was determined that the package needed to fit comfortably in the hand, sit on the table, and easily dispense and pour, the new form began to take shape. According to Domino, the resulting willowy canister embraces the original product proposition for a custom-designed structural form that is easy-to-use, highly functional, and elegantly styled to fit in with any kitchen décor. 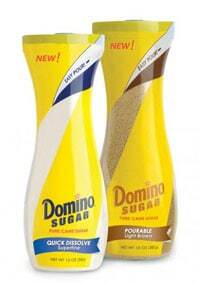 “As we continue to focus on the needs of our consumers, we are certain that these well-designed bottles are a convenient and attractive sweetener solution,” explains Domino Foods President and CEO, Brian O’Malley.